Only one, relatively small, new coal-fired generator with a capacity of 17 megawatts is expected to come online by the end of 2019. The decline in coal-fired capacity is expected to further reduce coal consumption: EIA’s latest Short-Term Energy Outlook expects power sector coal consumption to fall 4% in 2018 and 8% in 2019. One of the main drivers of coal retirements is the price of coal relative to natural gas. Natural gas prices have stayed relatively low since domestic natural gas production began to grow in 2007. This period of sustained, low natural gas prices has kept the cost of generating electricity with natural gas competitive with generation from coal. Other factors such as the age of generators, changes in regional electricity demand, and increased competition from renewables have led to decreasing coal capacity. Environmental concerns have also played a role in coal retirements. Coal retirements were highest in 2015, driven in part by stricter emissions standards required by the Mercury and Air Toxics Standards (MATS) rule, which went into effect in April of that year for coal- and natural gas-fired power plants. 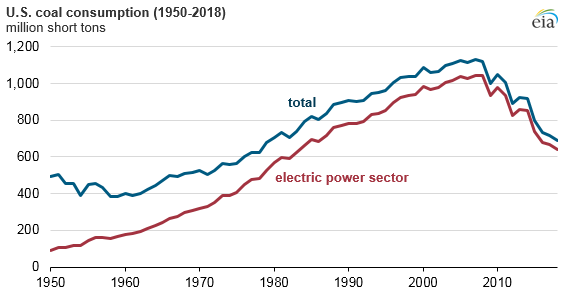 Instead of investing in emissions control technologies, many smaller power plants that operated at lower capacity factors were retired before the new standards were implemented. Some plants applied for and received one-year extensions, which contributed to retirements in 2016. Note: Actual retirements in 2018 based on data through September.